Discussion in 'Employment Opportunities - Help Wanted - Skills' started by Jeppo, Apr 15, 2019. Great gun and safe shop on West Market Street has an opening. For more information, PM our friend @18DAI. 18DAI, Cameron870, Sevenshot and 1 other person like this. Anybody looked into this opportunity? I haven't a need for the job, but I wasn't even aware this shop was around. Ill swing by and check it out. 18DAI and Jeppo like this. Directly across from the Post Office. Say hi to @18DAI for me. So, I went in, and darnit if you didn't cost me a whole wad of cash. Suckers had 3 of the guns I am semi-looking for. Wasn't able to talk myself into pulling the trigger, but by far one of the better selections around. Thanks for the heads up! 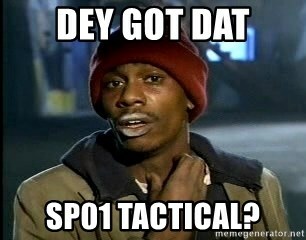 Did they have a SP01 Tactical, by chance? I actually think they did. They had a few CZs, and I do believe one was just that. I want to say around $650 or so. Id recommend callin. 18DAI and draco88 like this. 18DAI and B00ger like this. Think that guy has one? 18DAI and ripv2 like this. Not sure what I saw then, maybe it was a non-tactical model...it didn't have molle attachments...or a beard...so who knows. draco88, 18DAI and BatteryOaksBilly like this. Probably, but he looks like the type that would want a BOS and a copy of your papers. The Mighty Jeppo will never knowingly lead you wrong!!!!! 18DAI, B00ger and Jeppo like this.